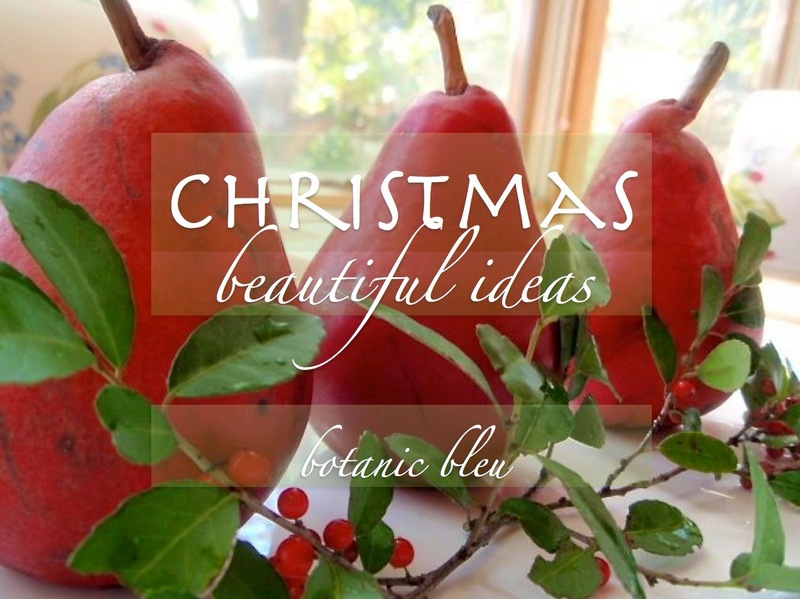 Christmas ideas and photos well before the holidays arrive. to plan their decorations and then have time to locate the supplies needed. What good is a great idea if you see it the day before Christmas? Many holiday parties begin the first week of December. are not always expensive or complicated. to simple, natural Nordic and French Christmas decor. capture the feeling and beauty of Christmas. 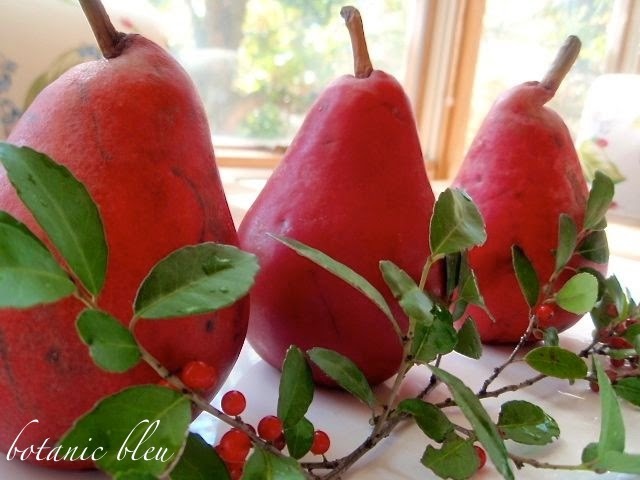 arrangement for a holiday table, buffet, or mantel. 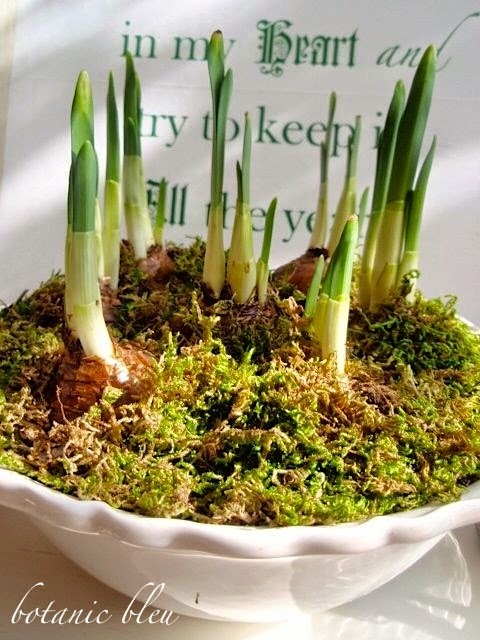 share small cuttings from theirs. from my holly tree with you. 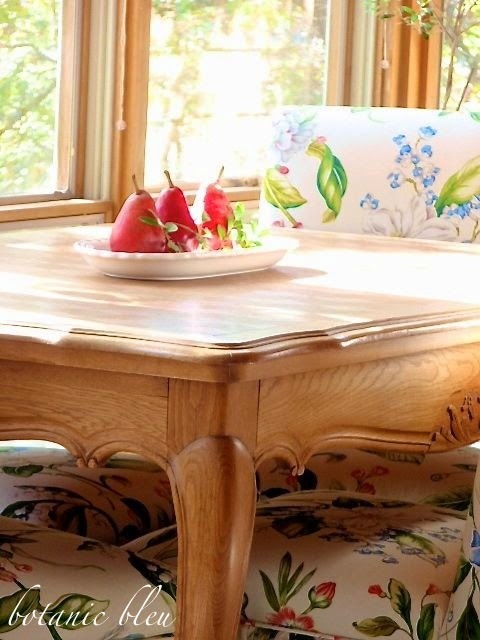 with scalloped edges protects the furniture and keeps the fruit clean. to remove both dirt and critters that may be hitching a ride inside the house. After all, this display is not for looks only. There were three pears; now there are two. 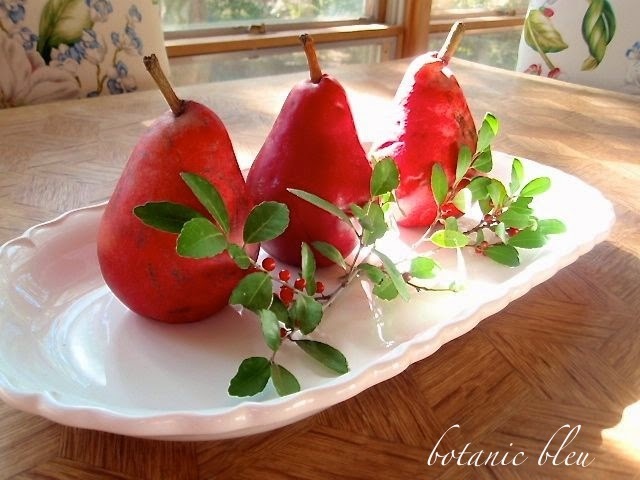 This is a beautiful way to serve pears meant for eating at a gathering. 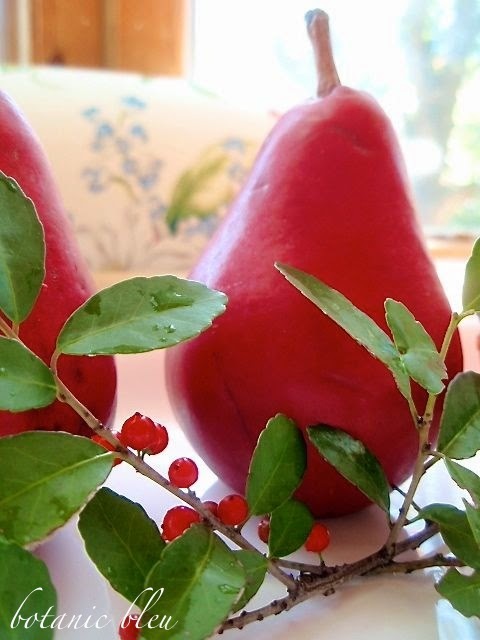 a festive way to serve the pears. A narrow serving dish gives plenty of room on a small table for other dishes. as dessert for the end of a French meal. blend with Christmas colors and vignettes. The little things in life can bring so much unexpected joy! even from the living room. even though we have had gloomy, overcast days for most of that time. 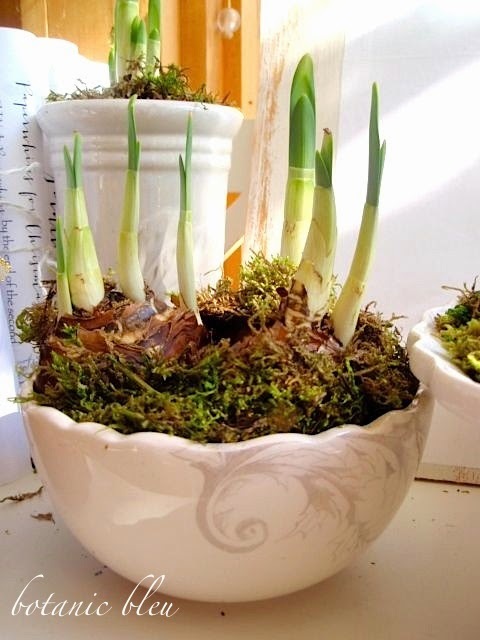 The most amazing growth is ONE bulb. 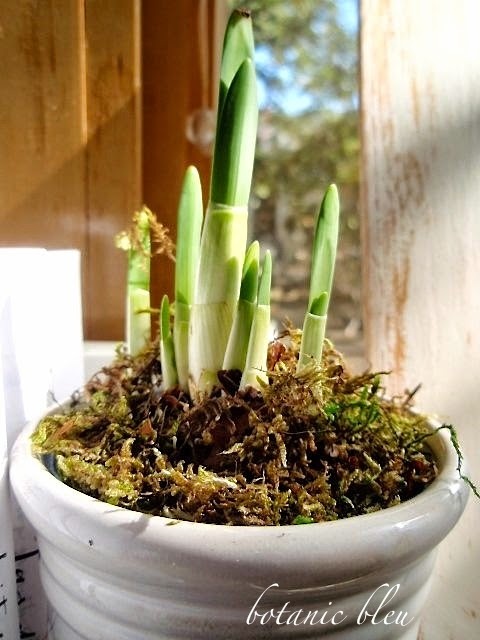 "not all bulbs are created equal?" of these shoots with the promise of many blooms. the company is having an end-of-season sale right now. No compensation, just recommending a great source. to express the beauty of Christmas from my home to yours. Oh Judith, now THESE are the perfect pop of color to set against a white (snow laden) background! 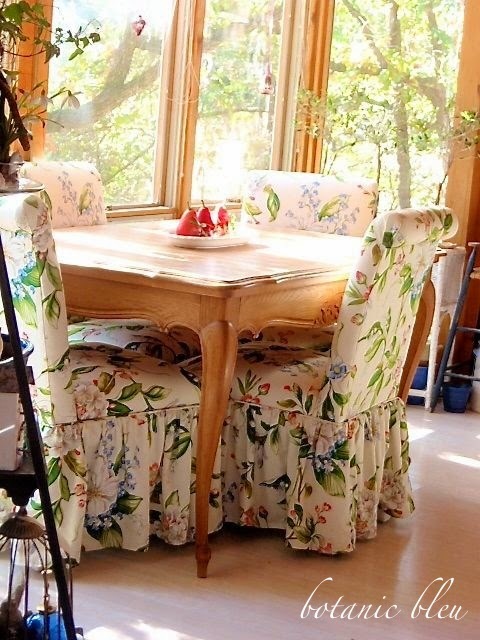 And what is great is that they are a natural element - a decorating favorite of mine that I just "discovered." 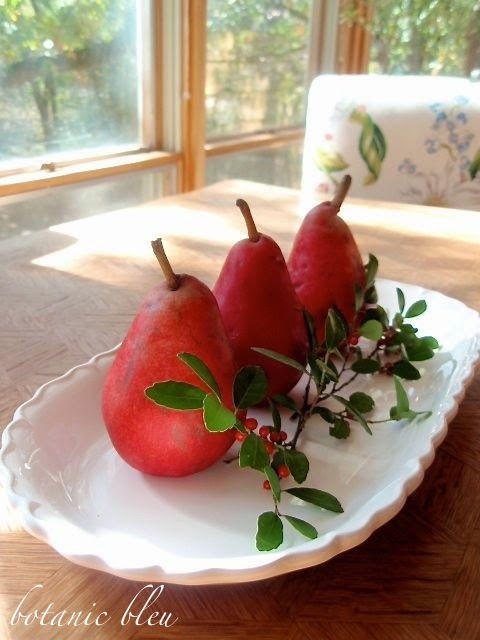 I want more natural pieces (antlers, fruit, nuts, twigs) in my decor and less "plastic." 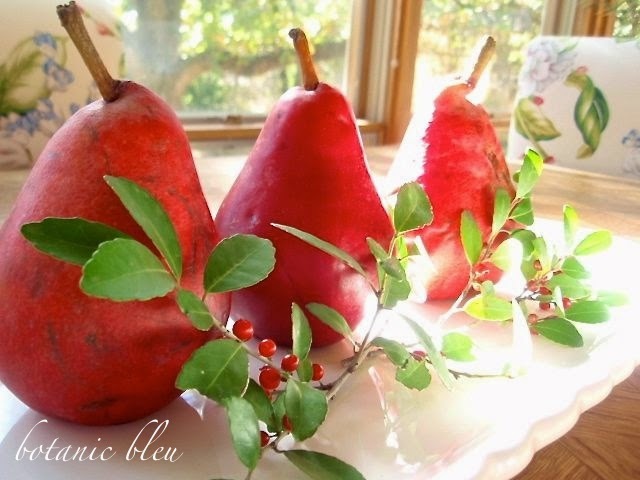 The pears are absolute perfection! Oh gosh, and with the sprigs of holly? Be still my heart. 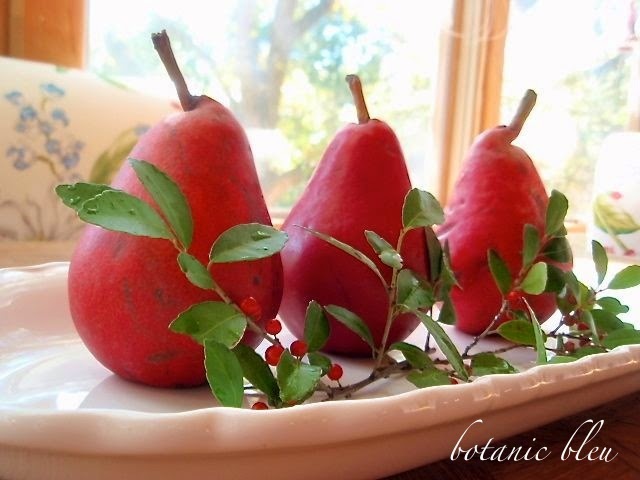 I have used apples, pomegranates, a pineapple too; but never pears. 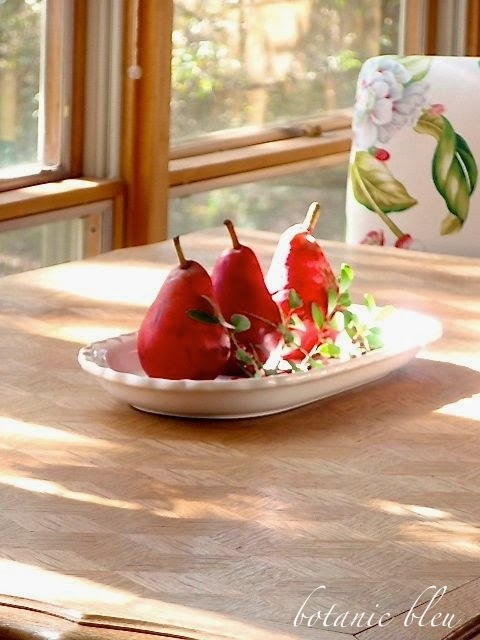 Your photos are lovely and I do love the way the white ceramic jumps out because of the high contrast with the red pears and holly berries. Wonderful job and idea Judith!!! Au naturale is au beautiful! 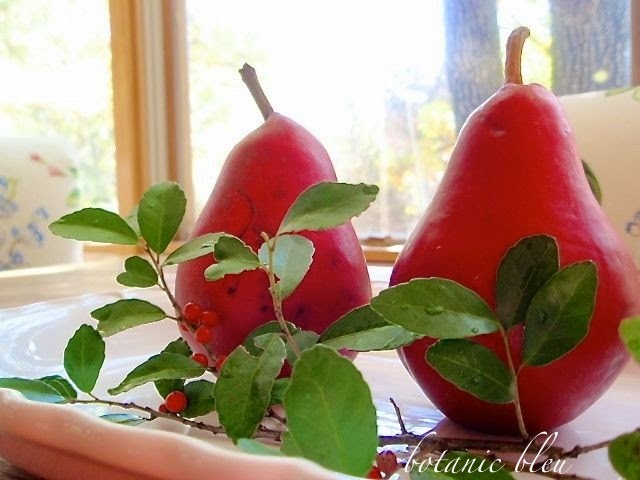 Your red pears are a testament that one need not go over the top to achieve a beautiful, classic look for Christmas. This post has inspired me as I plan to decorate my parents home for the holiday season. Beautiful, as always, Judith! Hope you have a blessed Thanksgiving! We'll have over 20 again around a table or on a sofa somewhere enjoying all of the traditional Thanksgiving things we like to have. So pretty!! Love how elegant this is. Thanks for sharing!! Love the simplicity of of this vignette.